During World War II, everyone played a part. Before Theodore Giesel gained worldwide prominence as a childrens’ book author, he was the chief editorial cartoonist for the New York magazine PM. Between 1941 and 1943, Geisel drew over 400 cartoons for the magazine, and also for other publications. It is a rare moment when an iconic figure shows his political colors–and a unique website allows us access to this part of his career. The Dr. Seuss collection at the Mandeville Special Collections Library at the University of California, San Diego houses all the original drawings and cartoons by the famous author. 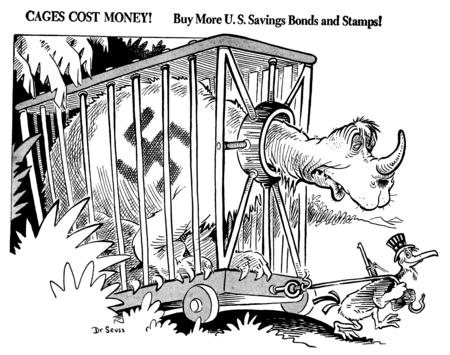 About 200 of these cartoons were reproduced in the 1999 book Dr. Seuss Goes to War. UCSD has digitized its entire collection and provided it for general use at its website Dr. Seuss Went to War. All his wartime cartoons for PM have been categorized by year, battle, geographic area and personality covered by Seuss. It provides an excellent resource for teachers making connections between the complexities of war and a beloved childrens’ author. Seuss was always political, and these cartoons show the political mind that would later create such controversial works as The Lorax and The Butter Battle Book. As exemplars of political cartoons, this database is second to none. The obviously excellent artwork provides hours of analysis, critical thinking and classroom discussion. Because they were made as events occurred, the Seuss cartoons have an immediacy that is often overlooked by students today. Finally, as a historical artifact, the Seuss cartoons allow students to see the war as readers at home saw it–through the eyes and pens of the writers and artists of the press. Enjoy these cartoons and please let us know how you used them.